Read the Patient Information Leaflet available from your pharmacist before you start using this medication and each time you get a refill. If you have any questions, consult your doctor or pharmacist. Take this medication by mouth with food, usually 4 to 6 times daily or as directed by your doctor. If you are using the tablet form, first crush the prescribed number of tablets and dissolve in a full glass (8 ounces or 240 milliliters) of cold water or juice. Stir well and drink the entire mixture right away. If you are using capsules, take your prescribed dose with a full glass (8 ounces or 240 milliliters) of water, juice, or milk to lessen stomach upset. If you are using the powder in packet form, mix your dose in a full glass (8 ounces or 240 milliliters) of cold water or citrus juice. Stir well to dissolve, and drink the entire mixture right away. If you use water to prepare the mixture, you may also drink a citrus or carbonated beverage after taking each dose to wash away the taste of the medication. Use this medication regularly to get the most benefit from it. To help you remember, take it at the same times each day. It may take 2 months or more before you notice an improvement in symptoms. What conditions does Potaba treat? Upset stomach, nausea, or loss of appetite may occur. If any of these effects persist or worsen, tell your doctor or pharmacist promptly. Tell your doctor right away if any of these unlikely but serious side effects occur: signs of infection (e.g., persistent sore throat, fever). This medication can rarely cause low blood sugar (hypoglycemia). The risk for low blood sugar increases if you do not consume enough calories from food for several days. Symptoms include cold sweat, blurred vision, dizziness, drowsiness, shaking, fast heartbeat, headache, fainting, tingling of the hands/feet, and hunger. If these symptoms occur, rapidly raise your blood sugar by eating a quick source of sugar such as table sugar, honey, or candy, or drink fruit juice or non-diet soda. Tell your doctor about the reaction right away. To help prevent low blood sugar, eat meals on a regular schedule, and do not skip meals. List Potaba side effects by likelihood and severity. Before taking potassium para-aminobenzoate, tell your doctor or pharmacist if you are allergic to it; or if you have any other allergies. This product may contain inactive ingredients, which can cause allergic reactions or other problems. Talk to your pharmacist for more details. Before using this medication, tell your doctor or pharmacist your medical history, especially of: diabetes, low blood sugar (hypoglycemia), kidney disease. What should I know regarding pregnancy, nursing and administering Potaba to children or the elderly? Before using this medication, tell your doctor or pharmacist of all prescription and nonprescription/herbal products you may use, especially of: aminosalicylates, sulfa drugs (e.g., sulfisoxazole). Does Potaba interact with other medications? Laboratory and/or medical tests (e.g., white blood cell counts) may be performed periodically to monitor your progress or check for side effects. Consult your doctor for more details. If you miss a dose, take it as soon as you remember unless it is less than 2 hours until the time of your next dose. In that case, skip the missed dose and resume your usual dosing schedule. Do not double the dose to catch up. Store the tablets, capsules, or unmixed powder between 46-59 degrees F (8-15 degrees C) away from light and moisture. If the powder form is not taken immediately after mixing, refrigerate the mixture in a container that is resistant to light (e.g., amber glass container, metal container, plastic container that you cannot see through). Do not freeze. Discard any unused mixture after 1 week. Do not store in the bathroom. Keep all medicines away from children and pets. 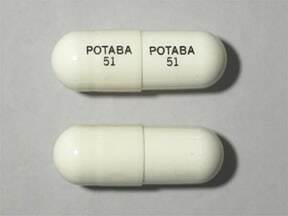 This medicine is a white, oblong, capsule imprinted with "POTABA 51" and "POTABA 51". Are you considering switching to Potaba? How long have you been taking Potaba?